Yes, THAT Santa Anna. The one who inspired the classic phrase, “Remember the Alamo”. The one who, when he lost a foot and part of his leg in battle, gave it an elaborate military funeral. In 1847, Illinois soldiers “came upon General Santa Anna’s abandoned carriage and found gold worth $18,000, a roast chicken lunch, and his artificial leg. They turned in the gold, ate the chicken and kept the artificial leg as a souvenir. So, why am I telling you all this? Well, it just so happens that Santa Anna and I have something in common. No, I do not have an artificial leg on display in a museum. At least not yet. 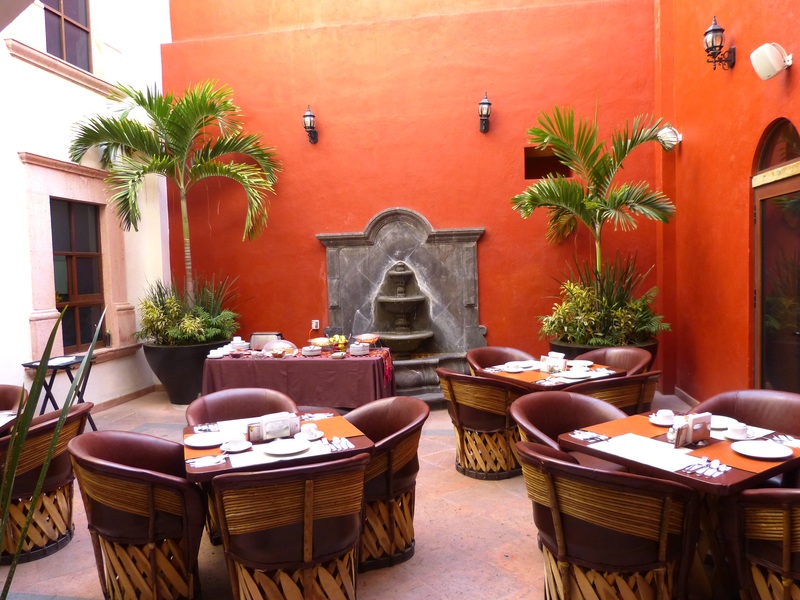 We BOTH have slept at the Hotel Hidalgo. But just to be clear, not at the same time. How do I know all this? I’d like to be able to claim that my attentiveness in history class and my truly amazing memory are responsible, but anyone that knows me would never swallow THAT tall tale. Nope, the source of my hotel knowledge came from this mural in its entry. 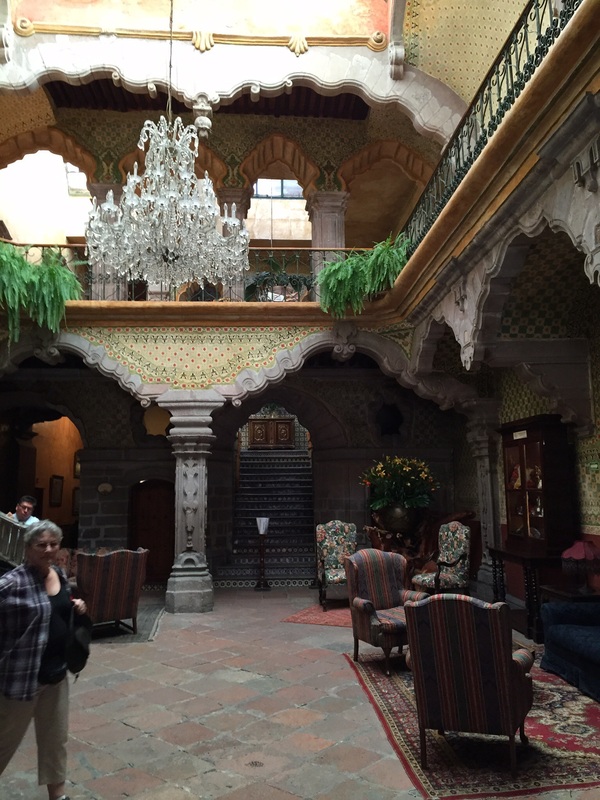 As one might expect of a hotel almost 200 years old, it has its quirks. For example, the size of the showers would lead you to believe that they were not a common feature back then. As with people, each room has its strengths and drawbacks. But with the right attitude, these quirks can become rather endearing. Plus, the staff is wonderful, the rooms are very clean, it costs less than $40 per night, and the location is absolutely ideal. If, however, you prefer to sleep in a convent, or in the house of a dead Marquesa, those options are also available. 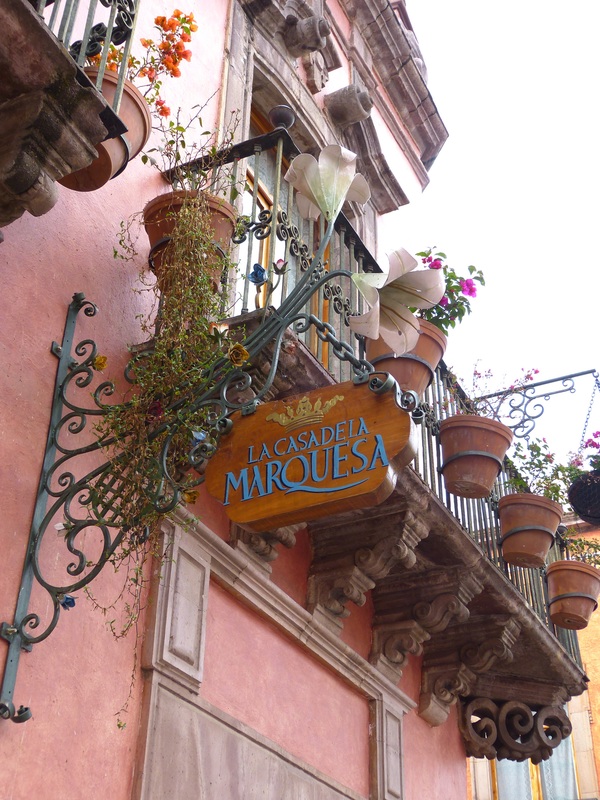 Those of you who have been reading along may recall the snarky comment I made a while back about La Casa de la Marquesa probably paying Google to show up on its maps. 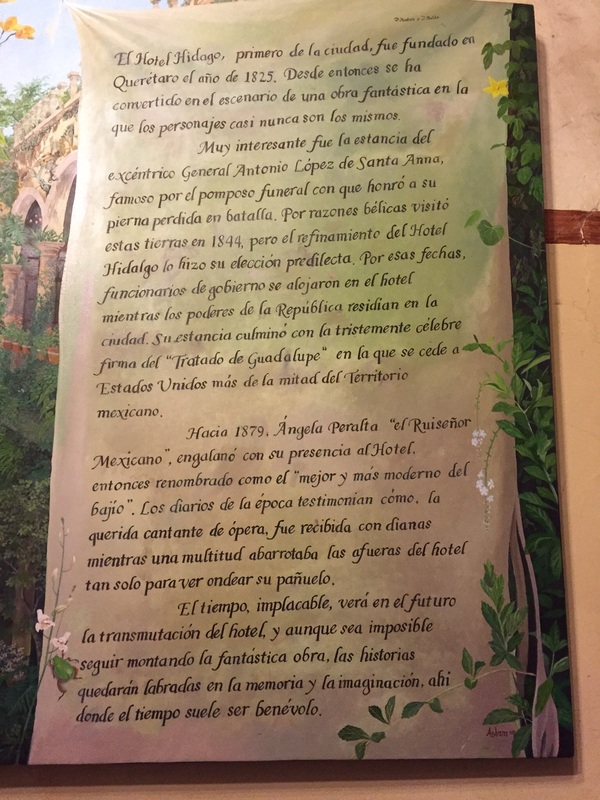 Little did I know that the Casa, like the Hotel Hidalgo, is a historical site with its very own legend. And you, dear reader, will soon read all about it. It seems that Don Juan Antonio, the Marques, although a married man, had a yen for a nun, Sister Marcella Nasturtium. 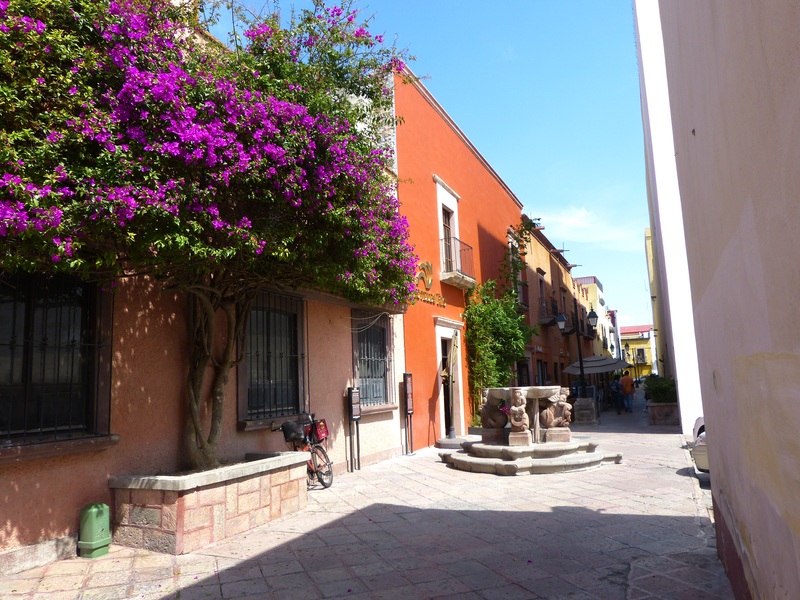 The good sister, despite remaining true to her vow of chastity, was still able to persuade the Marques to build an aqueduct to bring fresh water into the city, and to build the most beautiful house in Querétaro, which he then gave to his wife. One more hotel story then I’ll end this post. It seems that being a nun in the days of old was not a bad gig, if you managed to be born to the right family. One rich man built a convent for his daughter that was the grandest in a city filled with grand convents. 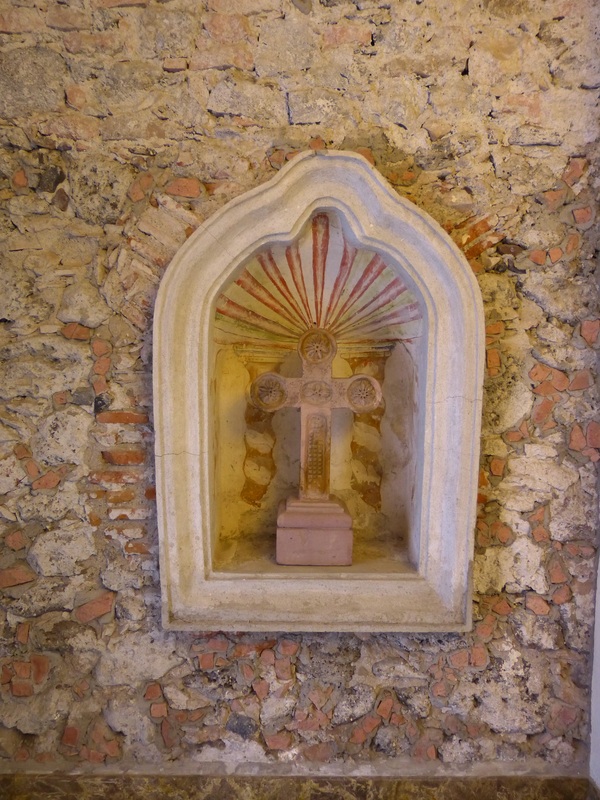 The Convent of Santa Clara had its own orchards and gardens, and the rents it collected allowed the nuns to live in private houses with their own servants. Wow. Hotel detail. What do you expect? It WAS a convent! And to think that YOU could sleep in ANY of these buildings! Is this not a cool city?!! Great pictures and great stories! What a wonderful experience you are having… thanks for taking us along! I’m so glad you’re traveling along. Thanks for the kind words! You have a way with words, dear Shelley. Or you can spin a yarn. Or twirl on your prosthetic …. Actually right now I’m picturing you as a saucy, wayward nun. I am laughing…a lot! (Would that be LAL?). I want to live up to your picture of me. This is a fascinating post and your photographs, as always, make it come alive for your readers. I learned so much and the next time I’m in southern Illinois visiting our children and grandchildren, I”m going to Springfield to see Santa Anna’s leg. My husband, who grew up in Illinois, laughed aloud when I told him the story. He had no idea Illinois housed such a treasure. Aww, thanks Janet. I’m always happy when I give someone a laugh! it’s SO good to know that at least SOME nuns got to enjoy the good life! Carmelites, sisters of Mercy + Notre Dame eat your hearts out! None of MY history books told this story … good thing we have you to tell it to our daughters!! And I have SO many stories to tell! This was an amazing trip! By the way, Eva doesn’t know it, but she has some new earrings from Mexico. Sorry–you don’t get the presents any more. It’s all about the next generation! do I get credit for the being the one walking through the lobby? Absolutely…and do I get credit for only using flattering photos?